Who is the patchwork girl? Is it Dorothy? I assumed it was until I started reading L. Frank Baum’s The Patchwork Girl of Oz. Now I’m not so sure. Now is a good time to say a huge THANK YOU to Speakeasy Society for introducing me to the entire series of books. I didn’t realize there were more after The Wonderful Wizard of Oz. The Kansas Collection inspired me to start reading them. I wasn’t sure what to expect as we approached the location for the second chapter of The Kansas Collection. I could see patchwork quilts covering the walls as I exited the elevator. Lyman was chatting with guests in the lobby near the makeshift bar. Furniture was scattered about the large room. Some of the drawers were hiding secrets. As I explored I found many letters, song lyrics, a list and more. I explored the area and chatted with friends until JinJur appeared summoning me and barking orders to get in line. My husband and I, along with another couple, followed her to a small room where she asked if we could be trusted. We were then asked who sent us and led into another area with a tent. Inside the tent we met a very upset Tin Man who no longer goes by the name Nick Chopper. His heartbreaking performance was superb. One of the characters then pulled me aside and threatened me for information which I was unable to give. My husband later told me that he didn’t even notice that happening to me because he was engaged in a secret conversation with the Tin Woodman. It’s amazing how Speakeasy Society manages to give each person their own unique experience even while we are only feet apart in the same room. I think this says a lot about the quality and effectiveness of the storytelling and the performers. We were led back to the lobby area where we explored a bit more and approached Lyman. My husband and I chatted with Lyman for quite some time. His quick wit had me laughing so hard tears were rolling down my cheeks. He helped clarify that this is taking place in Kansas. He also stressed repeatedly the importance of making choices. My interactions with Lyman were really the highlight of my night. I am very impressed with Speakeasy Society and look forward to Chapter 3. I highly recommend The Kansas Collection. We’re off to see the Wizard, the wonderful Wizard of Oz…or are we? It’s a choice. Make a choice. Should you or shouldn’t you see him? Either choice is a choice, so make a choice. The most beautiful thing about The Kansas Collection is the amount of choices you must make. Sometimes you may not even realize you are making them, but this theatrical event mirrors life in that way. The Key is chapter one of The Kansas Collection. This was my first time experiencing Speakeasy Society’s work. I’d heard about it from all of my immersive theatre friends, so I had to check it out. I went in blind. I had no idea that the show had anything to do with the Wizard of Oz. Honestly, I didn’t even realize it was The Kansas Collection. I just knew everyone loved it and it had something to do with keys. My husband and I attended the show together. We got our tickets online and eventually received the location in an email. Upon check-in I saw many familiar faces from the immersive theatre community waiting by the fire staying warm since the event took place outside and it a was chilly Los Angeles evening. Everyone was excited for the show and waiting their turn to be called back for their two person show. When Jeremiah and I were summoned to begin we first met with a vibrant character. (I would later find out his name is Lyman.) He set the mood by asking us questions and getting us involved. He then sent us into a tent to fill out a form. While completing our forms I asked the character Jo what the date was. He responded in a rather unusual way explaining that time works differently moving between Kansas and Oz. Then Jeremiah and I were sent in different directions to meet with our individual recruiters for the EC (Emerald City) to serve the Scarecrow King. I pledged my loyalty to the Scarecrow King. I didn’t just say the words, I meant them. I was told to be observant and avoid the man in the hat before being sent on my way back to the fire. I knew where the man in the hat was. I had seen other participants walking up to him and chatting. I wasn’t sure what to do. I talked with my friends for a bit and asked a few of them if they had been told not to speak to him or if I was “supposed to” anyway. Eventually with the encouragement of my friends I approached him hesitantly. I made that choice, even though I was told not to by my recruiter and had honestly pledged allegiance to the Scarecrow King. It was a moment of weakness. I received some information from him, waited while Jeremiah did the same and then we were off on another adventure. I’ve only been involved in the immersive theatre community for the last year or so and in that time I’ve experienced a handful of immersive events. Some of them included alternate reality games that lasted months before the paid events, but none of them worked quite the same way as this unique form of storytelling. Speakeasy Society sets the bar for this particular form of interactive storytelling. I’ve never experienced anything quite like it. The shows are fairly short compared to traditional theatre, but incredibly impactful. They are separated into many chapters. Each chapter is another theatrical event moving the overall story forward. It’s brilliant. I was not only impressed with the format and execution of the theatrical piece, I thought the actors did an amazing job. Overall I’m very impressed with Speakeasy Society and can’t wait to experience the upcoming chapters of The Kansas Collection. I love this company and Outbreak happens to be at my favorite 60out Escape Rooms location in Marina Del Rey. Not only is there easy parking, awesome staff, amazing food walking distance from the location, but they also have some of my favorite escape games at this venue. Outbreak is one of those favorite games. Outbreak is a wonderfully immersive experience. The set design, props, decor, use of technology is outstanding. The puzzles are not your standard “puzzle room” style conundrums, but rather a more hands on approach to figuring out what you might really do in the situation. I find this makes the experience all the more immersive and fun. However, if you are looking for a more puzzle heavy, mentally challenging game you may want to choose one of the other games at this location. However, if you want to really feel like you’re in a high stakes situation or a character in a video game that is going to save the planet, this is a perfect game for you. There is a serum that you must find to save the world from a deadly virus. I know it’s not the most original concept in the world of escape rooms, but they do such an amazing job of executing the game that the over-used theming that it’s perfectly fine. I mean, just because I’ve played games with that theme before doesn’t mean newer players have anyway. Besides, people love being a hero and saving the world. Overall Outbreak is one of my favorite games in the nation for it’s creative out of the box style, beautiful set and incredible immersion. It’s like spending an hour being in your own science fiction action movie, instead of just sitting at a theatre watching one. I highly recommend this game for players of all levels. One of my favorite bakeries is walking distance from this location. The Sinners & Saints Bakery has a large selection of delicious baked goods (including gluten-free) as well as unique coffee options. I’ve eaten here every time I’ve come to play games at the Marina Del Rey 60Out location. They have great Thai food with a good variety of gluten free options. It’s reasonably priced and always yummy. They have quick service. They are a couple of blocks from the games. I think they may be in a converted Taco Bell, so not a fancy place but a great local find. 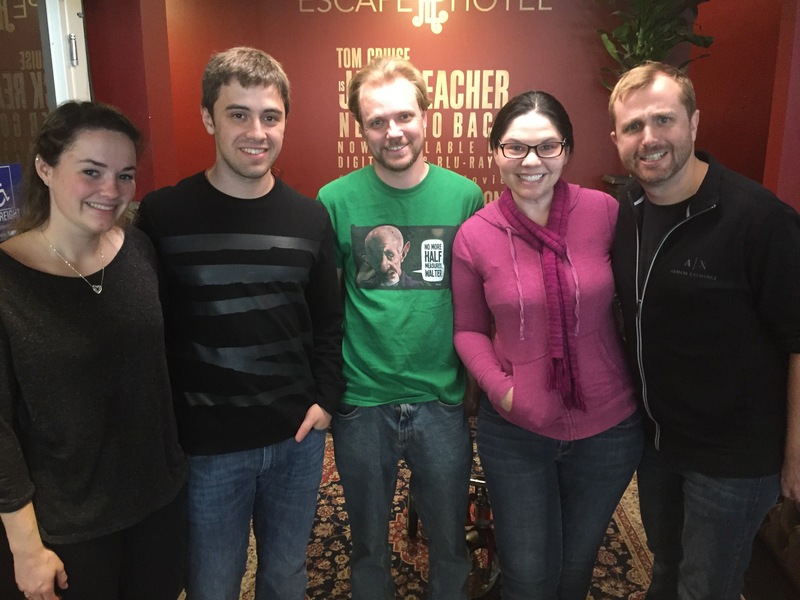 60out Escape Rooms is one of my favorite companies for escape games. They are creative, immersive, high-tech games. They always have outstanding set design and impressive decor. Hangover Game is another beautiful room that gives the players the feeling that they are in an actual game room/bar. It looks great. The theme was unique. I’ve seen mafia rooms and I’ve seen hangover rooms, but this is the first mafia hangover room. It was a clever story idea. They had a fun way of delivering information throughout the game that helped move the story forward, too. They have top notch customer service. The gamemaster was professional and on top of the action in the room for the most part. She wasn’t aware that one of the tech puzzles was malfunctioning at one point, but she was aware of the other tech glitches and let us know immediately. She gave us guidance without being aggressive with hints, usually waiting for us to ask. Unfortunately Hangover Game didn’t quite live up to my expectations of a 60out game when it came to the actual puzzles and game play. The high-tech room was a bit glitchy. We had trouble with a couple of the puzzles because the tech wasn’t functioning properly. When we spoke to our gamemaster she tried to explain that the room wasn’t properly beta-tested and they were still working out the bugs a month after opening to the public. I found that to be very frustrating. Most of the puzzles were not difficult to solve per se, but with poor execution they became more difficult than they should have been. There were a few puzzles that used props and set pieces in clever ways and others just didn’t make sense to the story and felt oddly out of place in the room. 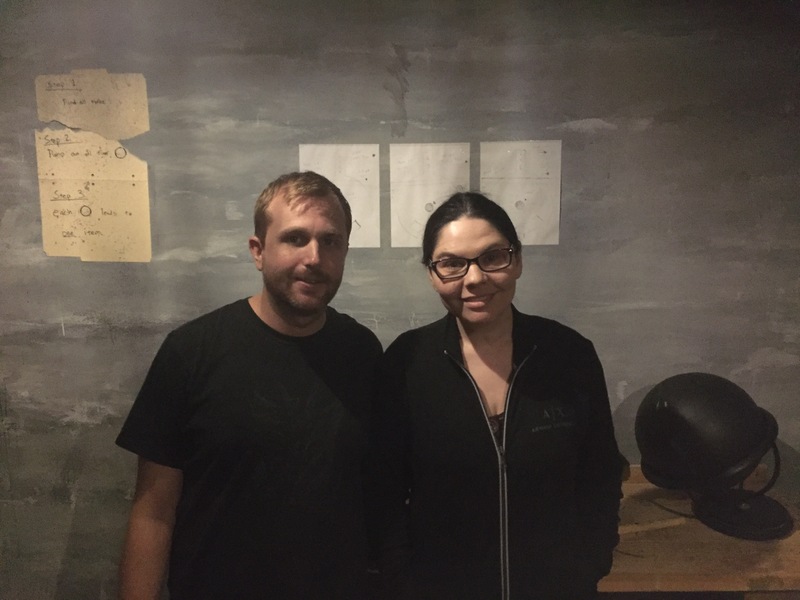 Overall, I love the 60out Escape Rooms company and think they create beautiful, fun games. However, in my opinion the Hangover Game is one of their weakest. If everything worked properly, it would be a fun game for new players. My favorite chicken place is a couple of blocks west on Melrose. It’s soooooo good and pretty healthy. They have gluten-free breading for their chicken strips and gluten-free cookies. The fountain soda machine has unique choices and so does the cooler. The staff is great too. What is the Black Matter Foundation? Is it real? Is it some sort of alternate reality game? Is it a promo for Half Life 3? Is it connected to Stranger Things? These are just some of the questions I’ve been asked over the past few days. Honestly…I don’t know. I won’t get into the information posted on their website, I’d rather you go there for that information. In this post I will share my personal experience so far. 7 pm Tuesday. I receive a Facebook message from my friend Matt asking if I saw the posts on the escape room Facebook group for Black Matter Foundation. I had not. Matt explained that a seemingly fake Facebook user named Edward Talbert had posted the link to the website in the group. However when I searched for “Edward Talbert” I was unable to find him. 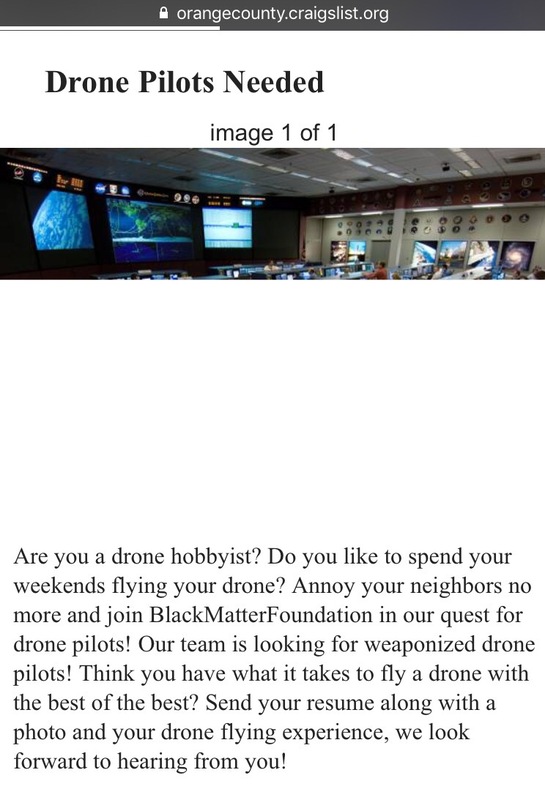 I did however find the Black Matter Foundation website, so I sent an email. I also started reaching out to my extreme haunt/ARG friends to see if anyone had heard about it. Nobody had. Thank you for taking the time to reach out to us, we appreciate your interest in our organization. Unfortunately due to the confidentiality of our work and the covert nature of our clients we are unable to disclose much information regarding our foundation. However, we have found that individuals who retain the inquisitive nature you seem to possess often excel within our foundation. If you find the time we would love to have you come in to our testing campus, for a free no cost evaluation. Our foundation projects are well funded and will never ask for monetary compensation. While we recognize that withholding information may not provide you with the answers you seek in entirety, we hope that you can see the bigger picture at play here. Please accept our apologies. Needless to say I got a bit excited. I responded to them immediately and started blasting my Interactive theatre friends online with the website asking if anyone had heard about this. Nobody had. However, many of them also got interested and started crafting proposals to send to Black Matter Foundation via email. Thank you for your interest in Black Matter Foundation. We take pride in capturing the best and brightest minds alive. Testing will begin shortly, applications can now be submitted for those with an access code. We hope to be seeing you soon. There is an audio attachment included in this email. Adrenaline kicks in and I’m wide awake “solving” the file. I aquire my password and use it to access an online questionnaire which I won’t go into depth about here because I don’t want to give away Spoilers for others wanting to participate. But I will say it was made up of fun, thought provoking questions. I submitted my answers. I will admit it was a bit of a challenge to solve the audio file and complete the questions on my cell phone, especially since so many of my friends were pinging my phone through Facebook, Slack and Texts about, you guessed it, Black Matter Foundation. When I checked on Tuesday I couldn’t really find anything online about it, however tonight I know many were discussing it on Reddit and Facebook. I will be sure to post again when I find out more…hopefully after visiting the Testing Campus. 2:15am Friday. Posting Black Matter Foundation blog post. Arcane’s Hideout is one of the most innovative and creative rooms I have experienced. It is very different in style not only from other escape game companies, but even from the original game at this location. The use of physical puzzle locks instead of the standard padlock is refreshing. They use some really unique contraptions that require players to solve puzzles in order to figure out how to move the devices properly to unlock the next step in the path. It is an escape room with some of the most out-of-the-box thinking I’ve encountered. The story is a continuation of their first room, The Agency. Your brother has left you a note that will give you guidance to begin your adventure in The Hideout. The puzzles don’t really seem to move the story forward, so to speak. At times I wasn’t even clear on why the puzzles connected to the story, but there were also times I could see they made a strong attempt. The decor is well done. The room really does feel like a strange little hideout. There is a strong wooden scent in the room. The props are good, as well. Everything seemed to work correctly as well as look nice. Overall, I think the room is a very creative and well done room. I myself didn’t click with the puzzle style or theme, but that’s a personal preference. It is a good room.